This week’s pitcher of the week is strikeout machine Joe Bircher (Bradley). 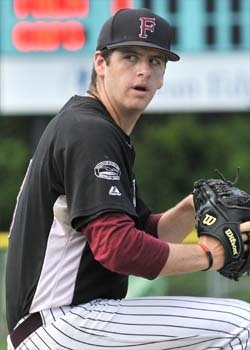 The southpaw recorded six innings of one-hit ball in a 6-1 win over Hyannis, allowing only an unearned run. He struck out nine without surrendering a walk over his six innings of work. Bircher is the Cape League leader in strikeouts this season, recording 25 in only 16 innings pitched. He sports a 1-1 record and a 2.25 earned run average. Bircher is a junior at Bradley, where he is the active leader in nearly every pitching statistic and a team captain. Ben Waldrip (Jacksonville State), the Cape Cod Baseball League home run leader, has earned this week’s player of the week award. Waldrip notched two of his league-best three round-trippers this week, while driving in four runs in four games. In a 4-3 win over Cotuit on Sunday, he went 3-3 with a double and a home run. Waldrip is a local product, hailing from Medford, Mass. The 6’6 lefty is a junior at Jacksonville State, and played for Y-D manager Scott Pickler for one season at Cypress College. 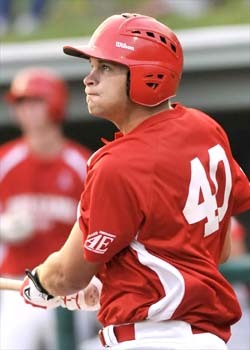 Waldrip was a draft pick of the Atlanta Braves in 2010, and was taken in the 40th round of the draft this year by the Kansas City Royals. More than 900 Major League Baseball players have also played in the Cape Cod Baseball League.